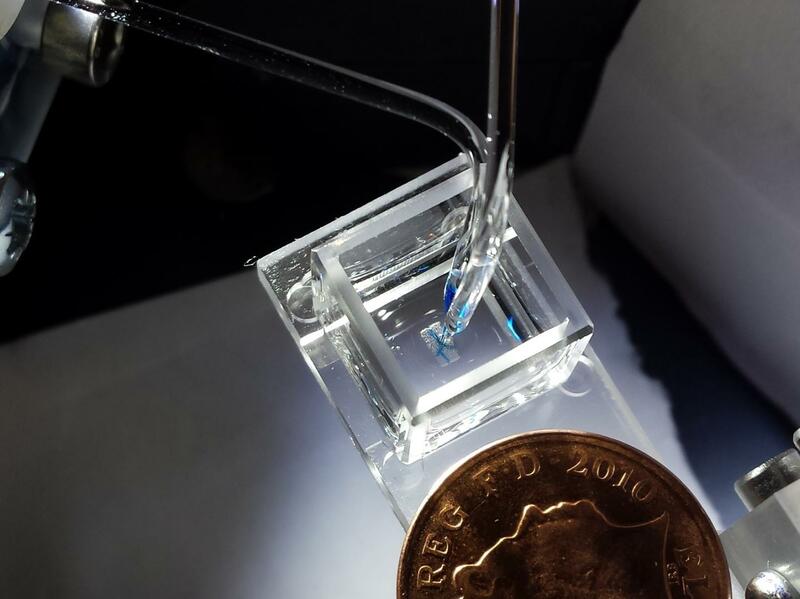 Scientists at the University of Oxford have developed a radical new method of 3D-printing laboratory-grown cells that can form complex living tissues and cartilage to potentially support, repair, or augment diseased and damaged areas of the body. Printing high-resolution living tissues is currently difficult because the cells often move within printed structures and can collapse on themselves. So the team devised a new way to produce tissues in protective nanoliter droplets wrapped in a lipid (oil-compatible) coating that is assembled, layer-by-layer, into living cellular structures. This new method improves the survival rate of the individual cells and allows for building each tissue one drop at a time to mimic the behaviors and functions of the human body. The patterned cellular constructs, once fully grown, can mimic or potentially enhance natural tissues. The researchers hope that with further development, the materials could have a wide impact on healthcare worldwide and bypass clinical animal testing. The scientists plan to develop new complementary printing techniques that allow for a wider range of living and hybrid materials, producing tissues at industrial scale. The study results were published August 1 in the open-access journal Scientific Reports. Bioprinting is an emerging technique for the fabrication of living tissues that allows cells to be arranged in predetermined three-dimensional (3D) architectures. However, to date, there are limited examples of bioprinted constructs containing multiple cell types patterned at high-resolution. Here we present a low-cost process that employs 3D printing of aqueous droplets containing mammalian cells to produce robust, patterned constructs in oil, which were reproducibly transferred to culture medium. Human embryonic kidney (HEK) cells and ovine mesenchymal stem cells (oMSCs) were printed at tissue-relevant densities (107 cells mL−1) and a high droplet resolution of 1 nL. High-resolution 3D geometries were printed with features of ≤200 μm; these included an arborised cell junction, a diagonal-plane junction and an osteochondral interface. 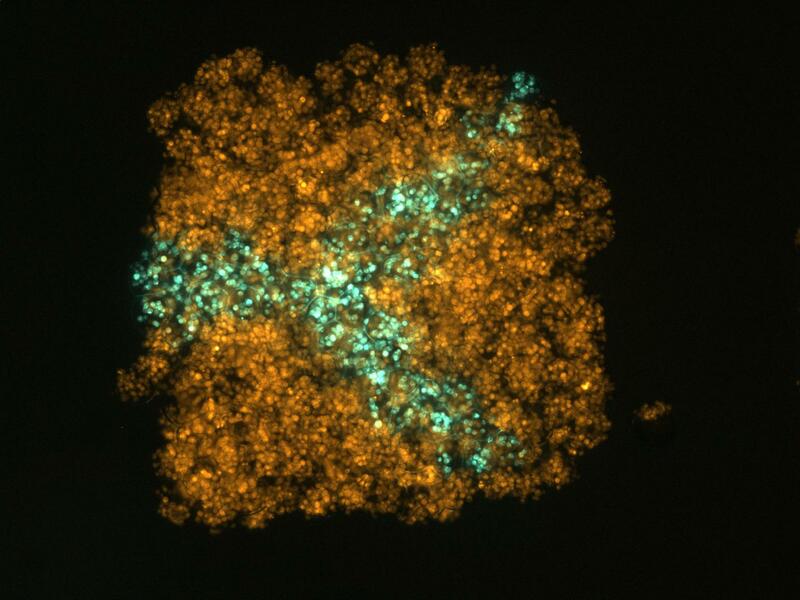 The printed cells showed high viability (90% on average) and HEK cells within the printed structures were shown to proliferate under culture conditions. Significantly, a five-week tissue engineering study demonstrated that printed oMSCs could be differentiated down the chondrogenic lineage to generate cartilage-like structures containing type II collagen.